A bit more progress to report, but it is still very slow-going. I finished the borders on both sides, and I have finally finished the urn! That urn took forever! Each section is done with a satin stitched and then outlined. Some of the areas are quite tight to work in. The next step was to do the antlers on the deer which was all done in outline stitch. A lot of ins and outs! 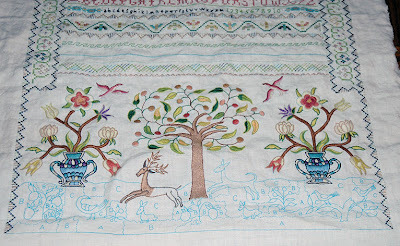 Then, on to body of the deer, with a French knot for the eye. Right now I am working on the largest part of the body which calls for a "long outline" stitch. I was having a hard time to get this to look neat, and wound up taking it out several times. I still don't seem to have the rhythm of it down! By the time you get to the end of a section, you have really mastered the stitch and you wish you had done it better in the first part! I guess that's how the school girls who first worked on samplers, must have felt also! Originally I wasn't going to put in any verse. There isn't any place marked for this. It is just mentioned on the front of the kit. I spent a lot of time trying to find a picture of the original online without any success. I did however find a later sampler circa 1815, also from Newburyport. It was very similar to this one. It appears that the verse was originally just above where the two blank lines appear. I think in this design, the area where the verse went was filled in with some lines of designs (green squiggle type lines). According to the description, the original verse was "Goodness and Mercy Ever follow [t]hose who shape there [sic] Conduct by Gods Holy Laws". I did some playing around with the lettering. It would be really tough to fit this in just the two lines provided. It will definitely not fit in cross stitch. It would have to be done in a straight stitch I think. This will take a bit of experimenting as there are no guidelines given. Great, just when I was looking forward to finishing this one up, now it will take even longer! I think it might be time well spent if it works though, otherwise, I will just take it out and leave it blank. I think if I didn't try, it would bother me every time I passed it in the hallway! Moving right along on "The Chase"